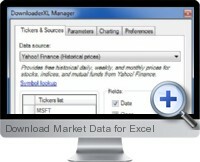 Download Market Data for Excel (Downloader XL) downloads free historical stock, index and mutual fund data from Yahoo Finance. Historical data is available from exchanges in the USA, Canada, UK, Ireland, Germany, France, Italy, Australia, New Zealand, India and more. RTQuotes XL - downloads real-time stock, index, futures, options and mutual fund quotes directly into Microsoft Excel spreadsheets. Free 15-minute delayed and fee-based real-time quotes for stocks, options, indexes, and mutual funds are retrieved from Yahoo! Finance. Data is available from more than 50 worldwide markets, including the US, Canada, UK, Germany, France, Italy, Australia, and India. Fee-based real-time quotes are available from PCQuote for stocks, options, indexes, and futures. Portfolio XL - a portfolio tracking add-in for Microsoft Excel. It allows you to create a portfolio of stocks which can be updated intraday. You specify certain tickers, the purchase price and date, and Portfolio XL monitors the price value of your portfolio and your transaction history. It also displays the current value of your stocks. Options XL - an option chains and LEAPS series downloader for Microsoft Excel. It downloads chains for options traded on these exchanges: CBOE (Chicago Board Options Exchange), AMEX (American Stock Exchange), PHLX (Philadelphia Stock Exchange), PCX or PSE (Pacific Stock Exchange), ISE (International Securities Exchange). Version upgrades are free for life.